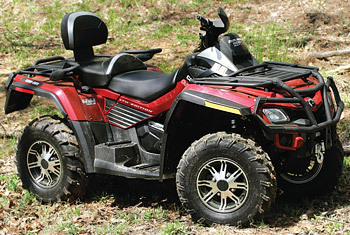 A notable 2010 change is an updated, top-of-the-line Outlander Max Limited. Available with either 800R or 500 EFI V-twin power, these fully dressed touring units come factory equipped with DPS power steering and the industry's first Air Controlled Suspension (ACS). In case you haven't noticed already, Can-Am loves acronyms. This revolutionary new suspension technology utilizes Fox Float rear shocks wrapped in a coil spring to assist with ride height. Drivers can select from six preset shock settings, fully adjustable on-the-fly and tracked in the LCD gauge cluster. The system actually raises and lowers PSI in the rear Fox air shocks, thanks to a small, under seat mounted air compressor. Can-Am's engineers thought it might be cool to provide riders the option of hooking an air hose and chuck to the shock compressor for filling tires. Yes, you can actually fix your own flats on the trail or, better yet, make your buddies jealous using the extra long hose provided to pump up their flat tires. If this wasn't enough, Can-Am added an all-new built-in Garmin NUVI 500 GPS. Other cool stuff including chrome goodies, hand guards, winch and more combine to produce the mud-borne equivalent of a BMW 7 series. All-new Outlander XT-P models are available in regular wheelbase dimensions or Max 2-up with 500, 650 or 800R V-twins. These come standard with DPS power steering and include premium painted yellow and black plastics, mud guards and XT-P specific wheels with a cool yellow insert to give your ride a custom look.